APPLETON, Wis. — Tyler Ayers has been named the Athletic Performance Coach at Lawrence University, Director of Athletics Christyn Abaray announced today. Ayers was hired after a national search to fill this position, which is new to the Department of Athletics. Ayers was the assistant strength and conditioning coach at Webber International University in Babson Park, Fla. Ayers, a native of Daytona Beach, Fla., had served in that role since July 2015. Ayers served as the interim head strength and conditioning coach at Stetson University in 2015 before going back to Webber International. He had worked at Webber International as coaching assistant for strength and conditioning for a number of sports. A 2014 graduate of Anderson (Ind.) 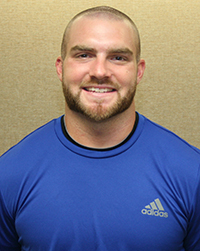 University with a bachelor’s degree in exercise science, Ayers also holds certifications from the National Strength and Conditioning Association, USA Weightlifting and the American Red Cross. Ayers played football at Anderson and served as the team captain as a senior in 2013. Lawrence opens the fall sports season on Sept. 1 when the men’s soccer team travels to Concordia University of Wisconsin. The Vikings’ first home contest is Sept. 7 when men’s soccer hosts MSOE in the Banta Bowl.